Creative Custom Embroidery (CCE) was created to meet the needs of customers who have small embroidery orders and want the option of providing their own items. CCE also provides a variety of items for personalization as well. We specialize in gifts for baby showers, weddings, anniversaries and birthdays. 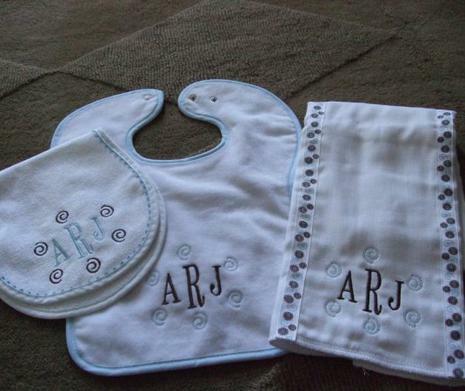 So make that "Special Gift" extra special by personalizing it with embroidery, monogramming, or vinyl transfer. We also design logos. Welcome to Creative Custom Embroidery! Website Navigation: This website contains three pages of examples of items embroidered for customers. Some customers provided their own items and some were purchased from CCE. We do not warranty items that you provide. We do warranty orders when we provide the item. You can place an order by contacting us by phone (919-815-2493) or email (ewwatson@nc.rr.com). Once we receive your order, we will provide a quote so that you can determine if you want to proceed. Pricing of items on the following pages are based on CCE provided items and do not include sales tax or shipping charges. CCE accepts personal checks, payment by credit card through paypal (paypal invoices are sent via email. CCE charges a flat rate of $25.00 to create a stitch file from an image. Not all images can be digitized.